If you are a new parent, you have probably noticed that squeezing in all baby necessities into your standard day bag is simply impossible. Yes, they are fashionable but lack compartments and space. Skip Hop is a company known for creating amazing diaper bags that are exceptionally well designed and look quite stylish as well. The Duo is one of their best-selling models and we can easily see why – it has numerous compartments, the bag is super light and easy to carry. A total of ten pockets, both on the inside and the outside of the bag. Arrives with a well-cushioned changing pad. A large selection of different colors and patterns. The mesh pockets on the sides might wear out after some time. The bag itself is quite tall and might feel a bit awkward to carry if you have a small stature. The quality of Skip Hop Duo Diaper Bag is evident and you will absolutely love the storage possibilities it will provide. You can comfortably go out with your little one knowing that you have everything they need close to you. Finding a good diaper bag is a must for every parent. After all, you will probably use in on a daily basis if you are constantly on the move with your youngster. What we love about Skip Hop Duo Diaper Bag is the fact that it is compact and very safe. The bag has grab handles, as well as a shoulder strap. They appear to be firm and really well connected to the bag itself. …it is compact and very safe. The bag can be securely attached to the handles of your stroller as well and it will not slip off no matter how much things you pack in. You can hook it on while on the move as well because the process is very straightforward and will not take too much of your time. The straps already have the stroller addition and all you need to do is click them. So if you don’t want to place the diaper bag underneath the seat because it is impossible to reach, this is an excellent feature that makes sure everything you need is close to you. Don’t forget to check the weight of the bag to prevent the stroller tipping over. The bag is made of high-quality polyester and it can last you for years. Skip Hop Duo Diaper Bag is completely BPA-free and doesn’t contain any phthalates either. There will be no color transfer from the bag to your clothes, even when it gets rainy outside which speaks volumes about the material. The designers working for Skip Hop really did their best to create a comfortable diaper bag that will not be too difficult to carry around. They included some extra cushioning on the shoulder pad which is made to stay firmly in its place. You can also adjust the length of the shoulder strap in order to fit your frame. This is super useful if both parents plan on using the same diaper bag because you can shorten or lengthen it in a couple of seconds. When it comes to storage, this bag might not be large but it can accommodate all necessities. It has ten pockets in total and you will be able to organize the inside compartment easily. The dividers will keep each item in its place and you can locate them quickly. The outside pockets are secured by magnets which are a really nice (and smart) touch. They are strong and will hold everything inside. Plus, we use side pockets more often and a zipper might not be the best solution for them because it can break. The side pockets are ideal for toys or some smaller items you might need. Additionally, you will also get two mesh pockets that are perfect for bottles. Therefore, both you and your little one will be well hydrated on your adventures. As we have previously mentioned, this bag is made to be on a smaller side but still provide you with enough storage space. The exact measurements are 13 x 4.25 x 13.75 inches which certainly helps with the versatility of the bag. It is easy to carry and you can transform it into a stroller bag as well. You will get four pockets on the inside which are protected by a zipper. One of the outside pockets is meant to carry your phone so you can easily pull it out when needed. You will quickly get a hold of how this bag works. We still haven’t touched upon the changing pad so this might be the perfect time to do so. It is a clever addition which will help you out in a time of diaper emergency. The changing pad is well-cushioned and you can quickly pull it out of the bag and place it on any secure surface. Therefore, your little one will always be clean and content because Skip Hop Duo Diaper Bag can act as a mobile changing station if needed. You can organize the items inside of the bag because it has several compartments. Having a clear view of everything you packed is very important to some parents and this bag will provide you exactly that. This bag is usually carried on your shoulder, but you can grab the handles and keep it in your hands. You also have a stroller bag option because the straps already have small cuffs that can connect to any stroller out there. …can act as a mobile changing station if needed. The design itself is quite gender neutral so everyone can carry this bag without feeling a bit out of place. Skip Hop Duo diaper bag looks like a standard messenger bag from afar and can be stylish as well. It is perfect for parents who do not want to invest in two diaper bags and want to share only one. The bag comes in a variety of different colors and patterns (ten different designs in total) so finding the one that fits you and your fashion sense is easy. The patterns are playful but still very clean and eye-catching. 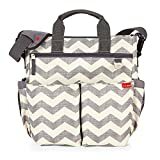 The MSRP of Skip Hop Duo Diaper Bag is $64.99 so it is definitely not the cheapest option out there. It is made for active parents who are always on the go so they will find it incredibly useful. The bag is exceptionally well made and it is clear why Skip Hop is one of the most popular brands among parents in the last couple of years. The quality is evident and paying a bit more for a high-quality diaper bag doesn’t seem like a bad idea. But you can always find it through places like Amazon (Check it Out) and have it delivered right to your door. The materials look really well and the bag itself should remain in pristine condition for years if you maintain it properly. The zipper is solid and will not break easily which is important if you carry the most important items on the inside of the bag. The mesh side pockets might get a bit worn out because mesh as a material is not super reliable but the overall feeling of Skip Hop Duo Diaper Bag is very positive. And we have to mention that cleaning this bag is very easy and you can even wipe off the majority stains with a damp cloth. Skip Hop Duo Diaper Bag is light, easy to carry, and incredibly versatile – you can use it either as a messenger bag on your shoulder, a briefcase in your hand, or simply hang it from the handles of a stroller. The inside of the bag is spacious and you can quickly organize it without making a mess. You can even place your laptop in this bag (if it is smaller than 15-inches) and it will be secure and well protected from all sides. We adore the unisex design which means that both parents can carry this bag. It does follow the classic diaper bag shape but the bag still looks modern and fashionable. A wide selection of prints and colors is definitely helpful and you will find the one that fits your personal taste. This diaper bag will arrive with a changing pad that is super comfortable and you can use it anywhere. So if you are in a park and your little one needs a change, you can do it on the spot. The materials are very high-quality and the bag feels durable. It has a shoulder strap pad that is well cushioned so you can carry this bag for an entire day without even feeling the weight. Skip Hop Duo Diaper Bag’s price is somewhere in the mid-range but it is still affordable. It is made for parents who love going out with their little ones but want to be sure that they have everything they need for the day right beside them, including the gadgets and baby gear.